Mutant Standard emoji are licensed under a Creative Commons Attribution-NonCommercial-ShareAlike 4.0 International License. Please check the license to see if using Mutant Standard is right for you. Where do you want to use the emoji? If you want to try out a sample of the emoji first, join the official Discord server :D.
If not, you'll need to ask your server admin if they can add the emoji for you. If you have Discord Nitro, you could instead make your own personal server for custom emoji. This means you can use whatever custom emoji you want anywhere without asking your server admin(s). You can follow the next steps with your own private server. You need to be on a computer running Windows, macOS or Linux to upload emoji to Discord. You can't do it on tablets or phones with iOS or Android. Download the emoji package below. Then unzip the download. If you're on Windows or macOS, you should be able to do that just by double-clicking the .zip file. Check out the link below if you don't already know how to add emoji to your server. Be aware that some of the filenames may overlap with emoji that already exist. If you find that they do that, consider adding ms_ to the beginning of the shortcode you give to the emoji when importing. Attributing is a legal requirement, but it's also generally cool because every designer deserves credit, and it helps people find the project! Don't worry, it's really easy. Copy the text in the box below and paste it in a #readme / #about / #rules channel, or any kind of channel that users can't chat in or edit. If you don't have one, make one! This server uses Mutant Standard emoji (https://mutant.tech) which are licensed under a Creative Commons Attribution-NonCommercial-ShareAlike 4.0 International License (https://creativecommons.org/licenses/by-nc-sa/4.0/). If not, you'll need to ask your forum admin if they can add the emoji for you. Download the latest 128px PNG version of the emoji below. Go to the Emoji subsection. Drag and drop the emoji directly into the page if you don't need to change the shortcode. If you do, enter the shortcode in the box at the top first, then press the Add New Emoji button to add the image. Keep repeating to upload whatever emoji you want. Copy the text in the box below and paste it somewhere in your forum's FAQ page. 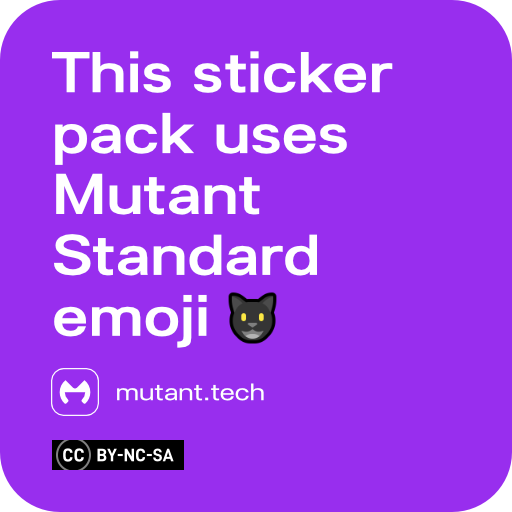 This forum uses [Mutant Standard emoji](https://mutant.tech), which are licensed under a [Creative Commons Attribution-NonCommercial-ShareAlike 4.0 International License](https://creativecommons.org/licenses/by-nc-sa/4.0/). This forum uses Mutant Standard emoji, which are licensed under a Creative Commons Attribution-NonCommercial-ShareAlike 4.0 International License. If you're not an admin of your instance, you'll need to ask your admin if they can add the emoji for you. Do you want to add all of the emoji, or some of them? If you want to add some emoji, go to Option 1. If you want to add every emoji, go to Option 2. Scroll to the bottom and click the Upload button. Add the image and type the shortcode (usually the filename of what you've added). Click the Upload button to add it. Keep repeating to upload all the emoji as you want. If you are providing all of Mutant Standard's modifiers in your instance, you might want to put this quick reference guide somewhere in your instance for your users. You need Mastodon 2.5 or higher installed on your instance to use this option. Keep in mind that Mutant Standard is in beta and some shortcodes are expected to change over time, which may cause conflicts or older emoji that don't get replaced. Mutant Standard also has a lot of emoji, which might cause bandwidth or page loading issues when your users are using the emoji picker. If want this option, it's recommended that you use this unofficial script (made by multiple creatures), once you've imported the emoji. This hides all of the colour modified emoji from your instance's emoji picker to save your instance's bandwidth and resources. If you don't feel ready or capable of managing this, go to Option 1. If you're not an admin of your workspace/team, you'll need to ask your admin if they can add the emoji for you. Copy the text in the box below and paste it in the purpose of your #general Slack channel (or any channel that serves a similar general-use purpose). Check out the official demo pack and the official cat smiley pack for samples! Download the latest Telegram Stickers version of the emoji below. Use the @Stickers bot to make a new sticker pack or add Mutant Standard emoji to an existing sticker pack. At the end of your sticker pack, just add this picture. Even if you have a Telegram pack that uses some Mutant Standard emoji and some stickers from other sources, you should still add this sticker at the end. Go to this page to see all the download options for Mutant Standard emoji. If you're not sure how to use the emoji, this page has guides for various apps that might be able to help you. If you're just playing around with the emoji personally, you don't have to do this. If you are using them somewhere in public and fair use doesn't apply, then attributing the project is a legal requirement. Don't worry, it's really easy. Just copy one version of the text below and paste it somewhere based on some of the tips below. This [thing] uses [Mutant Standard emoji](https://mutant.tech), which are licensed under a [Creative Commons Attribution-NonCommercial-ShareAlike 4.0 International License](https://creativecommons.org/licenses/by-nc-sa/4.0/). This [thing] uses Mutant Standard emoji, which are licensed under a Creative Commons Attribution-NonCommercial-ShareAlike 4.0 International License. This [thing] uses Mutant Standard emoji (https://mutant.tech). If it's a website or social app, put it somewhere static. Put it in a static place only admins can edit (like a readme channel, about page or footer) and where anyone can easily see it. It should not be put in a message or post. In other visual works, place it somewhere noticeable. If you're using the emoji in some non-moving visual work, place it somewhere next to it wherever it is presented so people can see. If the emoji are appearing in a presentation or video, place the plain text small version somewhere that works for you. Use the full size if you can, but use the mini version if you can't. If you can, place a full-size version, but if you don't have space or time, just use the mini version. If you are providing all of Mutant Standard's modifiers in your server/community, you might want to put this quick reference guide somewhere for your users. Random and experimental ideas that don't belong in the normal set. Download the latest version of the emoji below. Take a look at the guide here for how to attribute. Created and designed by Dzuk . Tech help and software development by kiilas . This website is ©2017-2019 Dzuk, all rights reserved. Check the license to see if using Mutant Standard is right for you.